Stolen Magic is a sequel to A Tale of Two Castles. This time the root of the story has almost entirely vanished in my telling, but the inspiration was a nineteenth century fairy tale called “The King of the Golden River” by John Ruskin. There are no fairies, but the Southwest Wind is a character, and so is a golden mug that turns into the king who gives the story its name. If you check it out you’ll find atmosphere galore and the evil effects of greed. Avarice fuels my story, too, and the mountain setting comes into it as well. My magical characters are the detecting dragon Masteress Meenore and the ogre Count Jonty Um, who are back again, plus two brunkas, a new kind of creature I invented. One of the brunka powers is the ability to create rainbows. Cool, right? But not cool if you touch one. This was a hard book to write! I kept confusing myself. In fact I wrote an embarrassing number of pages before I realized that I’d forgotten to put in any suspects, and you can’t have a mystery without them! Later, I changed my mind again and again about who was bad and who was good. 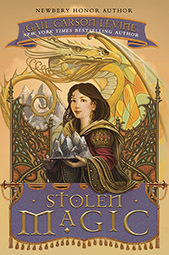 When you read Stolen Magic, I hope you do, too!